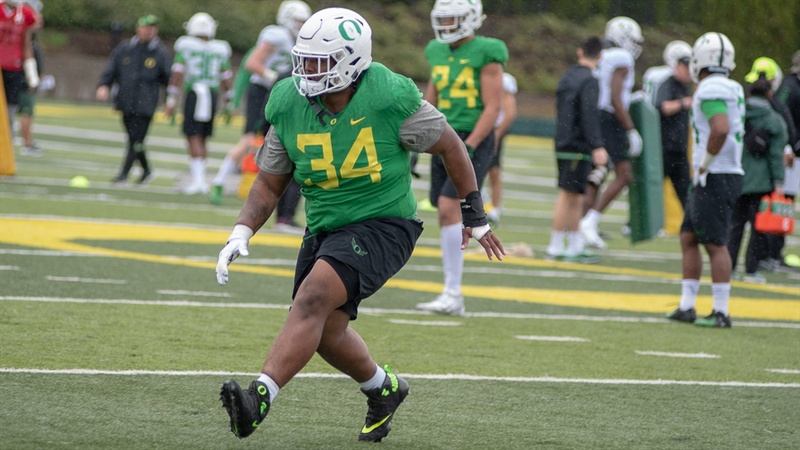 The Ducks held their first outdoor practice of the season Tuesday, and thanks to some Autzen-adjacent magic they were able to fit in a session with only a bit of light rain. Dallas Warmack kicked things off with an emphatic speech in the middle of the huddle, and from there the Ducks maintained that same high level of energy. Unfortunately and inevitably, the list of limited players grew. Bryan Addison was wearing a noncontact jersey and a cast on his left hand and thumb. He was joined by Justin Collins, who was wearing a brace and moving slowly throughout warmups. The recievers joined a growing list of limited players, which includes Isaah Crocker, JJ Tucker, Jacob Breeland, Josh Delgado, Calvin Throckmorton, Sam Poutasi, Chris Randazzo, Steven Jones and Jevon Holland. Oregon started practice with warmups, as it always does, then moved on to a ball-swarming drill. The offense took some snaps and then the squad separated into position-specific activities. Through all the injuries, Oregon’s first team has stayed consistent. At the skill positions, Cyrus Habibi-Likio, Brenden Schooler, Johny Johnson III and Cam McCormick got snaps. The second team included Malasala Aumavae-Laulu, Juwan Johnson, Mycah Pittman, Ryan Bay and CJ Verdell, with Tyler Shough running the show. It seemed to be a good practice. I think Saturday's Hillsboro trip last had a lasting effect, as the players look more ready than ever for football season to get underway.